It was such a blast photographing Kristen and Andrew. They are such a sweet, down to earth couple and they smile so much when they are around each other. They met through mutual friends who play ultimate Frisbee and they have recently begun playing the sport together competitively. The last few images of this session show Kristen proudly wearing Andrew’s jersey number. I had an absolute blast walking around Annapolis and exploring with these two. They are lovers of nature and wanted to showcase that in their images, and we were able to find some gorgeous trees around town with the sunset peeking through. 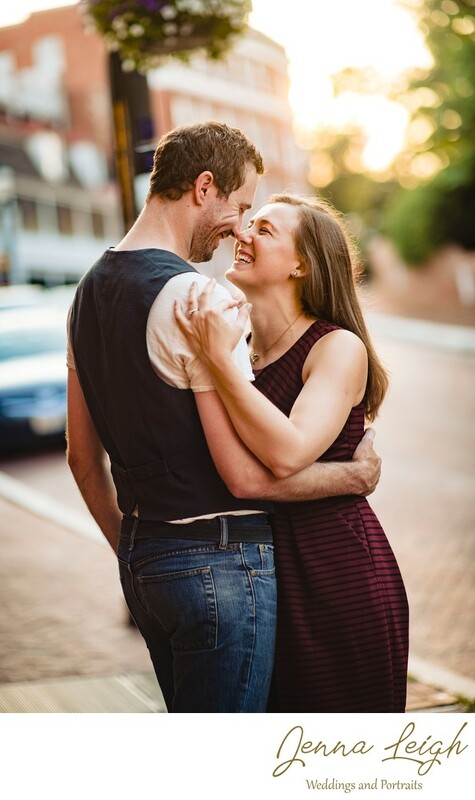 I am so excited to be photographing their wedding soon, which will take place at a sleepaway camp! It’s so unique and so fun, and I’m very honored to be a part of it. Thank you Kristen and Andrew for the amazing time in Annapolis and for choosing me to capture these images. Can’t wait to see you guys again soon! Location: 16 Francis Street, Annapolis, MD.